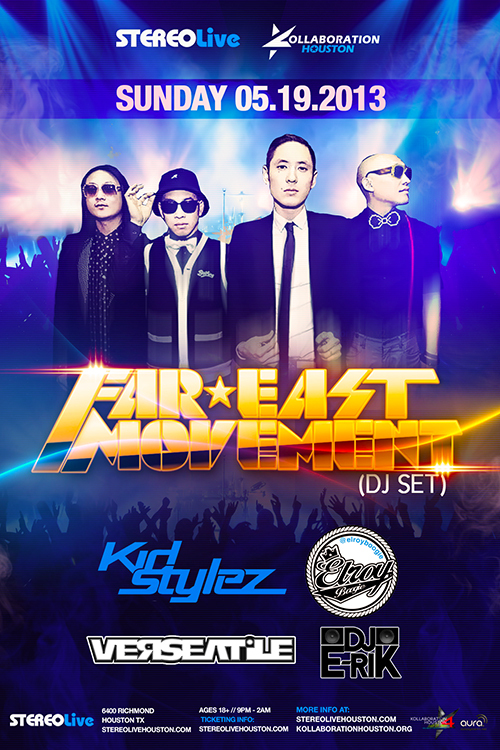 Far East Movement at Stereo Live next Sunday night, May 19th! They will be performing some songs and their DJ will be spinning a set. Then they will be partying with the crowd! A portion of the proceeds are going to funding the upcoming Kollaboration Houston 4 show (July 27th, Stafford Center) , so please come out and support! Me, Elroy Boogie, Dj E-Rik, and Dj Verseatile will be opening it up! So come out and get crunk!